Mrs. Holly Moore was born and raised in Cameron, Texas. She is a first-generation Aggie, having received her Bachelor’s Degree in Business Administration in Accounting in 1995. She is a classically trained pianist with more than 30 years of musical experience. 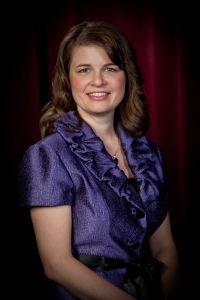 She has served as the pianist for multiple churches and school choirs. In addition to this, she has also accompanied various worship services, children’s choirs, and UIL soloists. She frequently provides music for weddings and funerals and has given many private piano lessons. She has been with the Singing Cadets since 2010 and in that time, has traveled to three continents with the group, played for President George H. W. Bush and First Lady Barbara Bush in their own living room, performed on Fox News live, and performed at least 250 Singing Cadet concerts. In addition to being Lead Music Accompanist of Choral Activities, she also serves as Head Librarian and the Liaison for the Association of Former Singing Cadets. In her free time, she enjoys cooking and spending time with her friends and family.